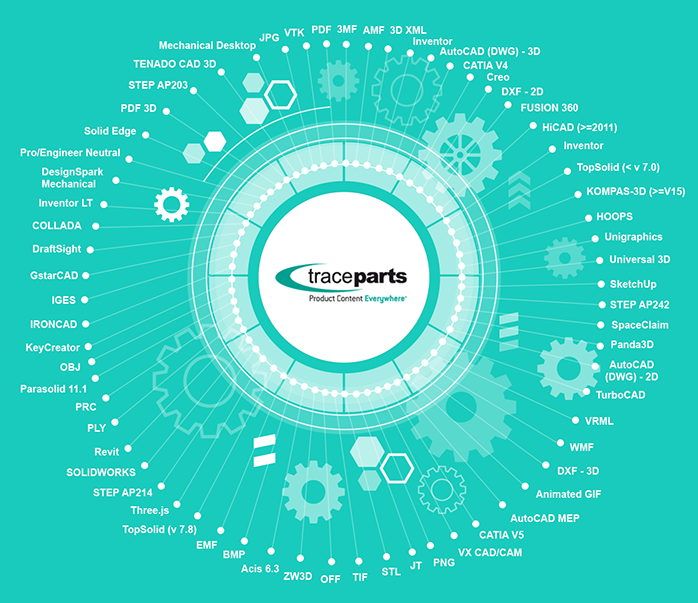 Catalogs powered by TraceParts exclusive technology offer multi-CAD & native models that can be seamlessly integrated into virtually any of the CAD systems used by your customers. State of the art technology to deliver native 3D models of your products for the CAD, CAE, CAM or ECAD software they use. Quick turn-around on CAD drivers new releases, to make sure your 3D catalog always remain compatible. High level of integration with their design software, including fully detailed Bill Of Materials (BOM) data to facilitate procurement and purchasing. Direct support from CAD & PLM vendors’ R&D and Marketing teams. Supporting 60+ different CAD, Imaging, Viewing and 3D Printing formats. Contact us to let us handle the heavy lifting for you! More details about TraceParts partnerships with CAD & PLM vendors are available in our Partners’ section.